The rights of animals as pets have recently been raised to the status of law in Nicaragua, with the passage of Law 747, for the protection and welfare of domestic animals and domesticated wild animals. We, however, argue that a fundamental flaw exists in this legislation, in treating wild animals in the same way as domestic animals. Dogs, cats, cows and other animals have co-evolved in intimate association with humans, so that now, they are not viable in populations independent of interactions with humans. On the other hand, the animals we see in the following photos have not co-evolved as pets. They are wildlife, not pets. 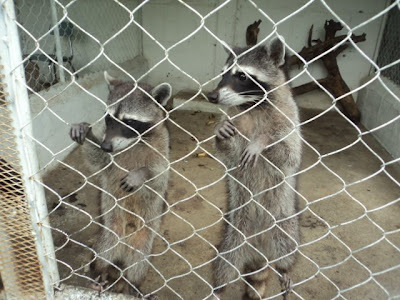 Putting these animals in cages makes them prisoners, not friends of humans. They all need to be free to live and die in their natural habitat, not forced to be close to humans. FUNDECI/GAIA and Movimiento Ambiental Guardabarranco are collaborating in a campaign to stop the cruel treatment of wild animals in the pet trade in our area. 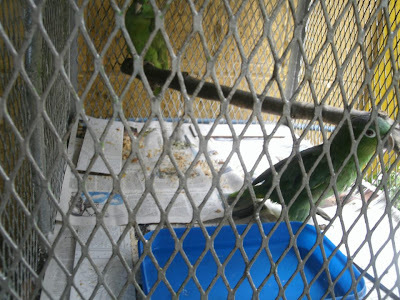 We have liberated several animals that were mistreated and we hope to achieve more liberations. This Chestnut-billed Toucan (Ramphastos swainsonii) lives in depressingly cramped quarters in a preschool in Masaya. Photo by Ilse Diaz. 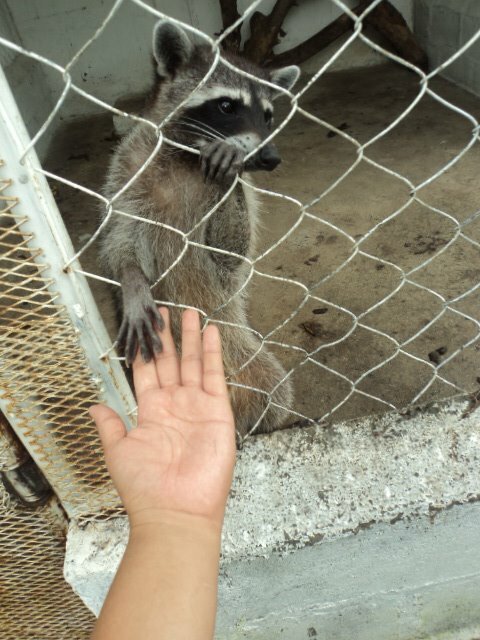 Gimme five! Lemme out! Photo by Ilse Diaz. 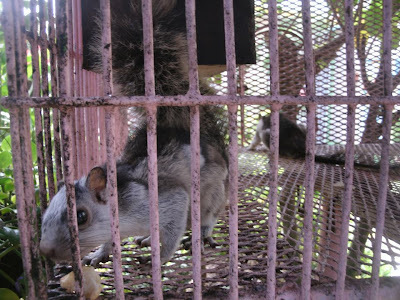 These squirrels are depressed because they do not belong in cages. Why do people think this is a good thing to do? Photo by Ilse Diaz. These variegated squirrels (Sciurus variegatoides) are in very cramped quarters, and have become listless. They will die of sadness if their conditions do not change soon. Photo by Ilse Diaz. 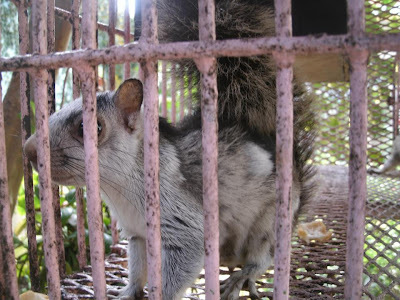 The poor health of this variegated squirrel is evident from his patchy fur. 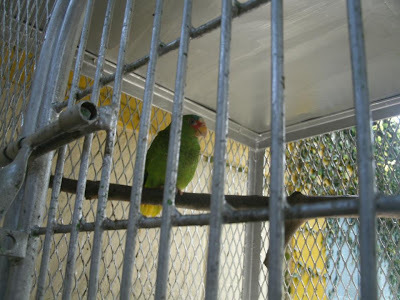 He is extremely unhappy in a cramped cage which is torturing him. Photo by Ilse Diaz. 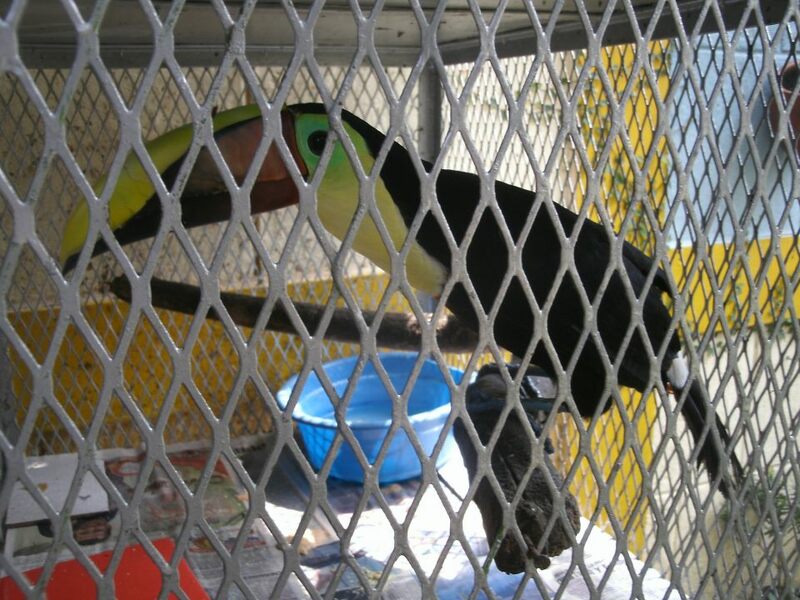 This Chestnut-mandibled Toucan (Ramphastos swainsonii) can not even hop in his cage, because the roof is so low. He only has less than one meter of vertical clearance. Photo by Ilse Diaz. 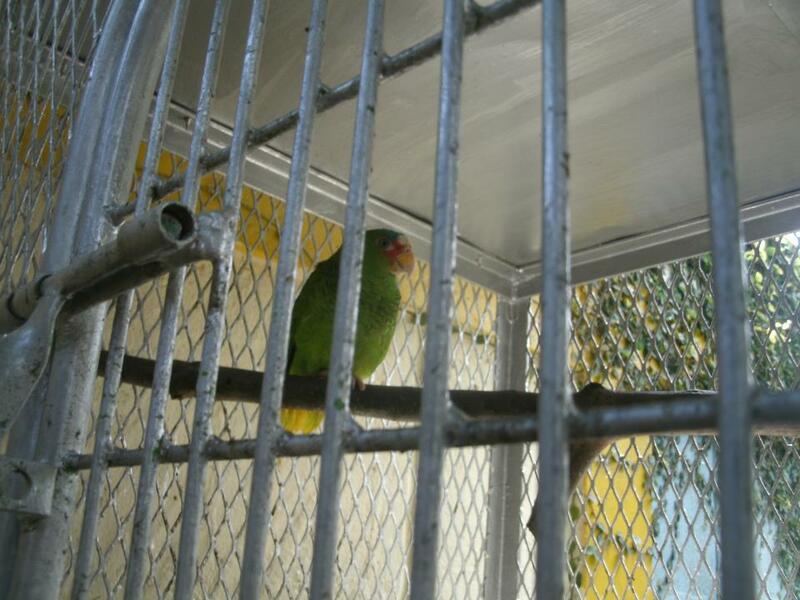 This White-fronted Amazon Parrot is all alone in a small cage. Photo by Ilse Diaz. These two Mealy Amazon Parrots (Amazona farinosa) can not even think of flying. Photo by Ilse Diaz. Raccoons definitely do not belong in cages. They should be free to roam in the forest. This is cruelty! Photo by Ilse Diaz. These sad photographs of cruelty to wild animals were shared with us by Ilse Diaz of Movimiento Ambiental Guardabarranco in Masaya, Nicaragua. Would you like to volunteer with us to stop the trade in wild animals in Nicaragua? Please contact us for more information. 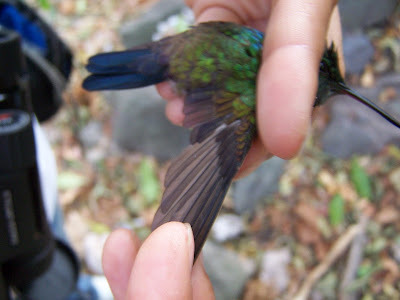 When people ask us what we do at Estacion Biologica Laguna de Apoyo, we often do not know where to start our response. We receive visitors from near and far. We grow trees and reforest natural areas. We offer simple, wholesome meals and lodging for those who come. 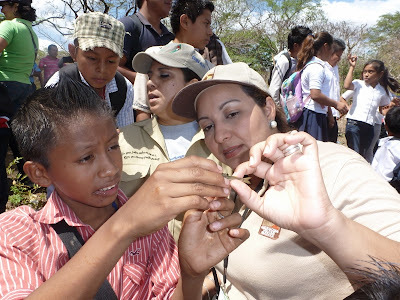 We provide opportunities for volunteering in environmental and social causes. We collaborate with governmental instutions, businesses and nonprofits, and people individually and in groups to improve lives of all of us, support sustainable businesses and protect the Laguna de Apoyo Nature Reserve and the wild nature found in it. 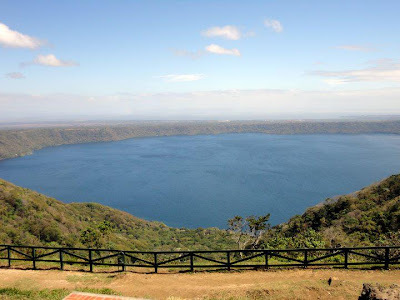 Visitors to Laguna de Apoyo must make a trip to Catarina to see the lake from the "mirador". Photo by Sandra Wallace. We also train. 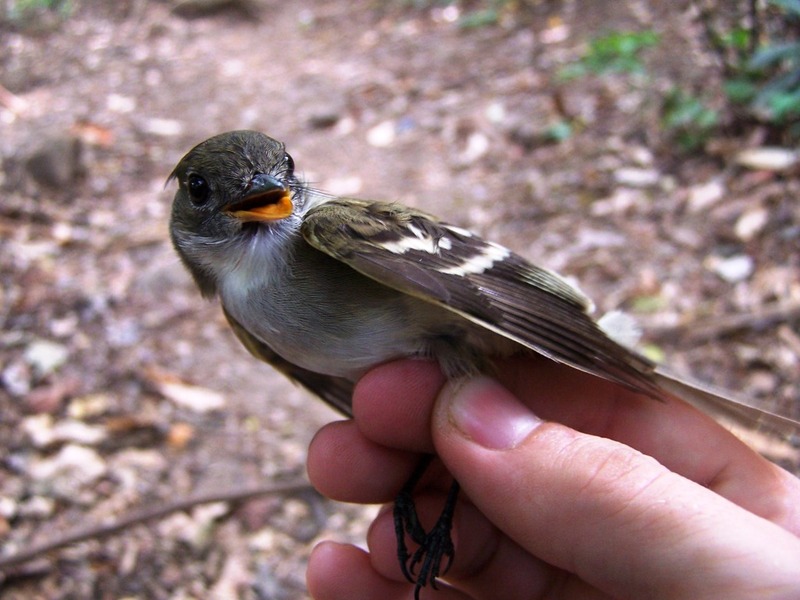 We train people to work with wildlife, to identify birds, fish, and other animals, and plants. 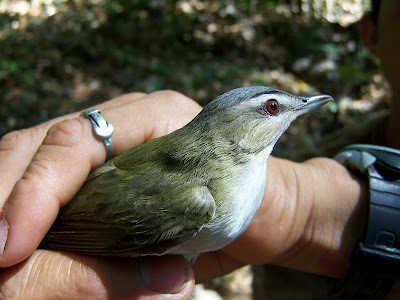 We perform research on the environment in our area and on the wild nature found here. 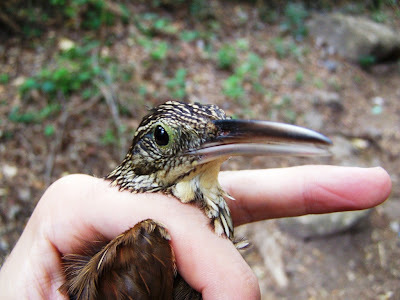 We involve Nicaraguan and foreign interested people in our research. We plant trees and we work with the landowners and government agencies to resolve the issues that made the trees disappear in the first place. The biological research station "Estacion Biologica Laguna de Apoyo" is set among nature , and even the howler monkeys frequent our garden. Photo by Christine Bruxer. 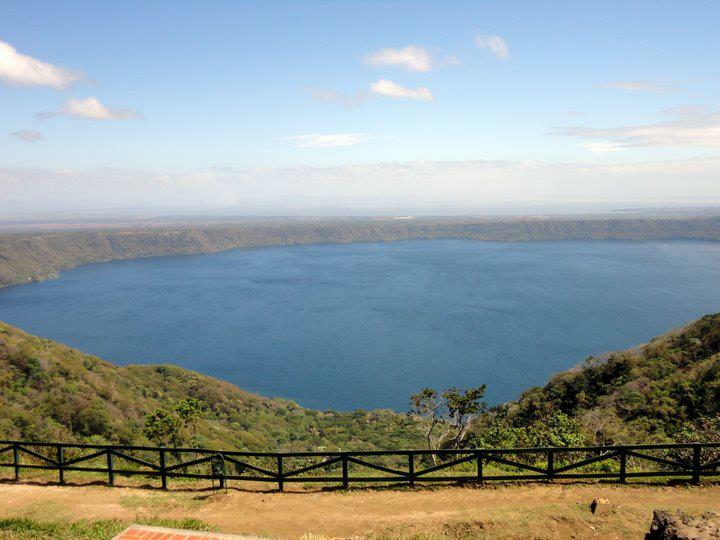 We also provide opportunities for tourists to enjoy the natural beauty of Laguna de Apoyo Nature Reserve. 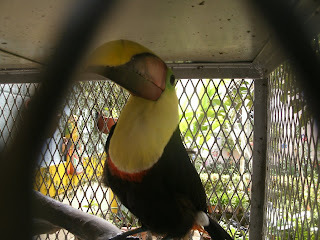 We take visitors birdwatching and scuba diving. We maintain a beach front at Laguna de Apoyo for all to use, free of charge. The "guardabarranco" is known in English as the Turquoise-browed Motmot (Eumomota superciliosa). 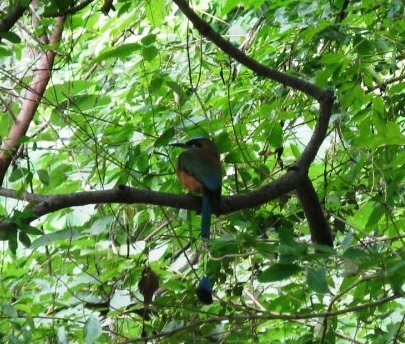 Thanks to high, vertical banks along the road cut behind Estacion Biologica Laguna de Apoyo, this bird is abundant in our garden. Photo by Christine Bruxer. We teach ourselves and others on a variety of topics, including nature, the environment, rural development, and even Spanish language and culture in Nicaragua-because, after all, any volunteer, student or professional must communicate well to work with the people! 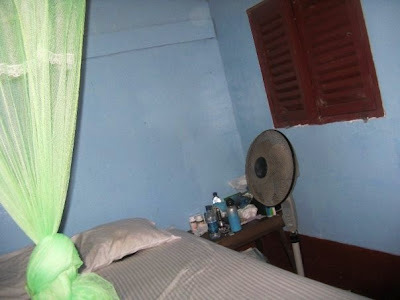 Accomodations at Estacion Biologica are rustic and simple. Photo by Christine Bruxer. Our accomodations in Laguna de Apoyo Nature Reserve are simple. We have fans, internet service, and electricity, but no air conditioning. We provide a great setting for someone who wishes to be near nature. We severely minimize the use of toxic chemicals such as pesticides and poisons. 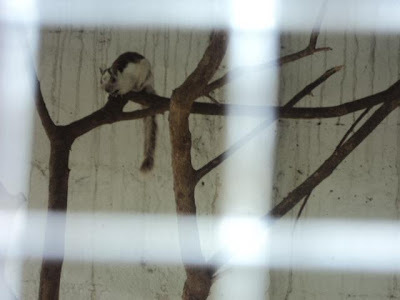 We try to integrate our presence into the environment with a little negative impact as possible, and we have seen the results-monkeys, woolly opossums, squirrels and warblers are often within several feet of us on our patio. 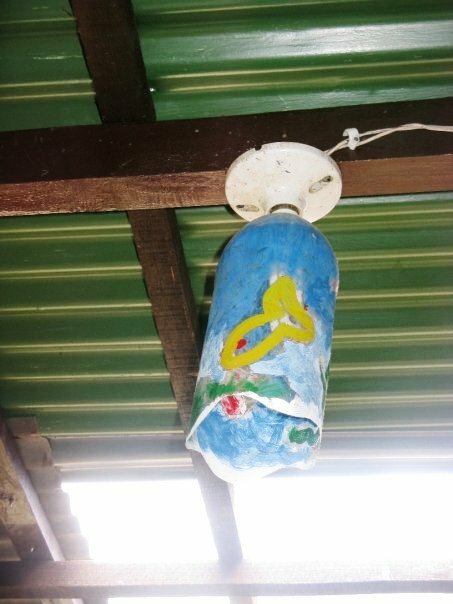 Volunteers recycled plastic bottles discarded along the beach into lightshades in Estacion Biologica Laguna de Apoyo. Photo by Christine Bruxer. We provide opportunities for volunteers, students, and professionals to be involved in research, conservation, and educational activities. 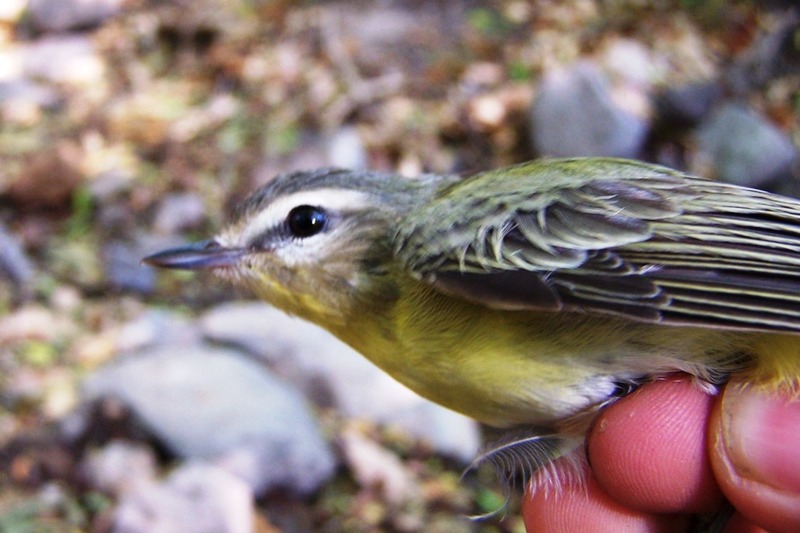 Nearly year round, we have volunteers performing reforestation, assisting in wildlife monitoring, and conducting environmental conservation and education projects. Our volunteers make a big difference in the environmental issues here. 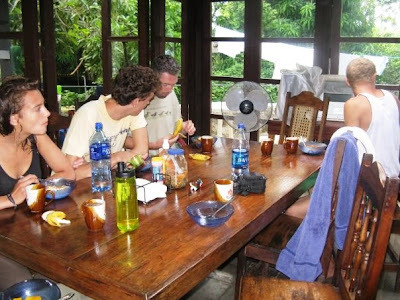 Volunteers and scientists are enjoying breakfast at Estacion Biologica Laguna de Apoyo. Photo by Christine Bruxer. We provide a place for people to come, enjoy, learn, participate, and relax. 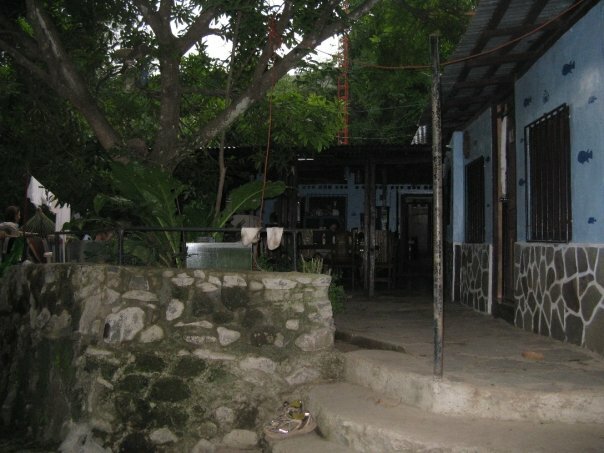 We operate a small hostel with very low prices, with great home-cooked meals, and the best coffee to be found anywhere. Our hostel service helps us finance our presence in Laguna de Apoyo Nature Reserve and some of the research and conservation activities we perform here. We are hardly an ordinary hostel, as is noticed by the conversations held here most evenings, drifting toward issues of wildlife, conservation, politics, culture, with meaningful voices found to contribute. 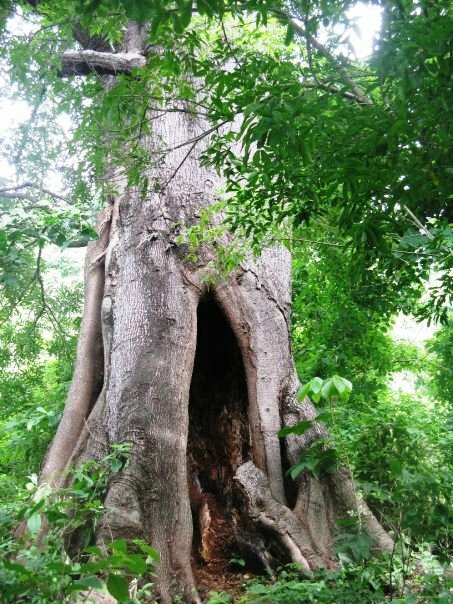 Large hollow trees such as this one provide habitat and sustenance for many animals in Reserva Natural Laguna de Apoyo. Photo by Christine Bruxer. 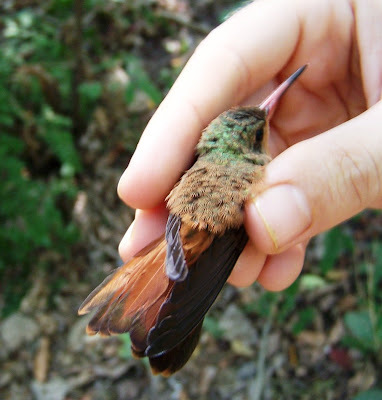 The presence of Estacion Biologica in Laguna de Apoyo Nature Reserve benefits the people and wildlife, too, because we serve as the eyes and ears of the area. Nearly every day, we are in communication with the park guards or other representatives of MARENA, or with some other governmental office. We have denounced and stopped several illegal constructions and other kinds of forest destruction activity. We have begun to monitor bat populations in Laguna de Apoyo Nature Reserve, with some very interesting results. 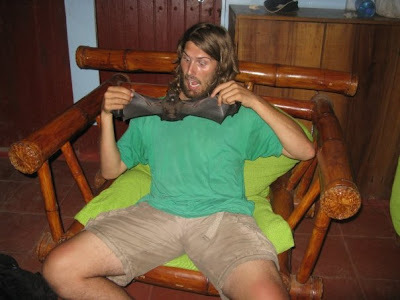 Twenty-three bat species have been found in the area, to date. We conduct lots of research on biodiversity and environmental issues. Photo by Christine Bruxer. 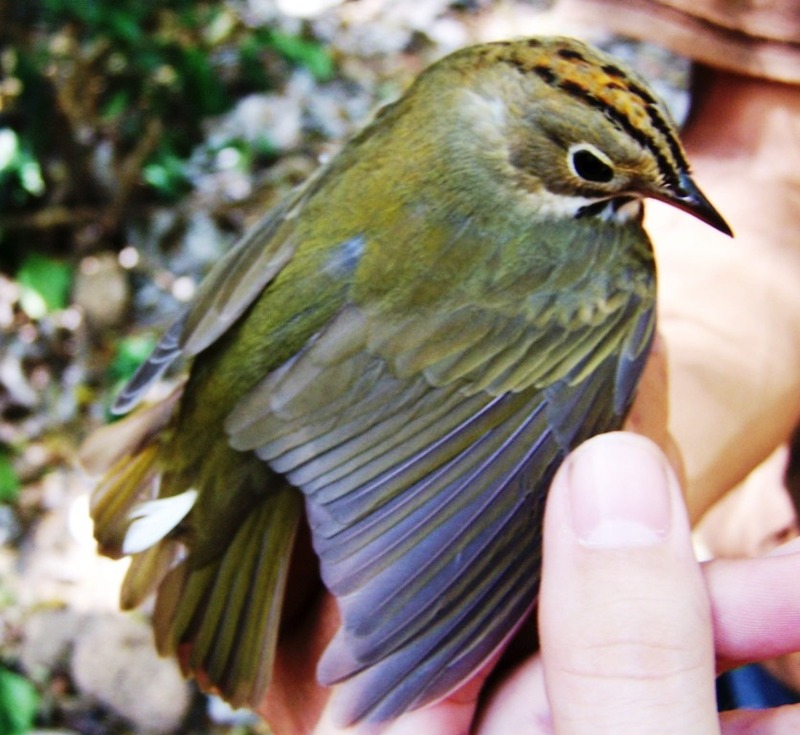 We provide opportunities for students and interns to gain experience in field activities, in which they get to handle wildlife and learn about their biology and behavior. 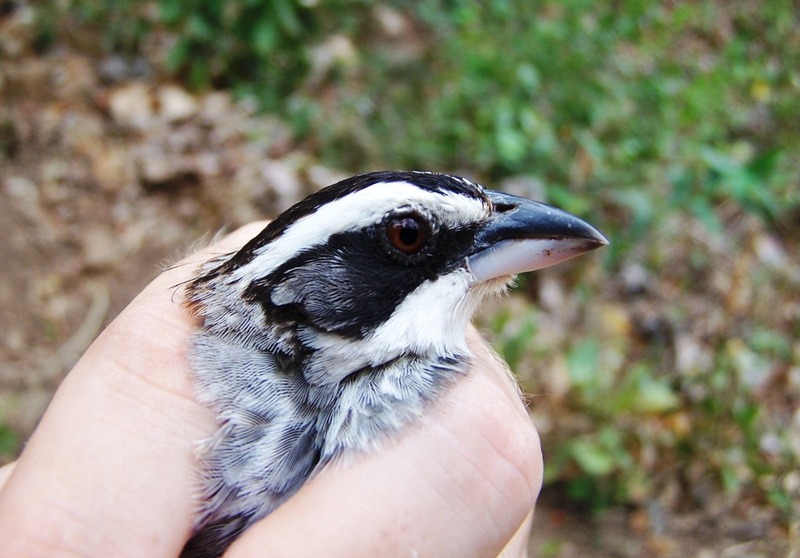 The studies our students perform are part of a larger program of wildlife monitoring, in which we are examining the impacts of different forest uses on the wildlife of our area. 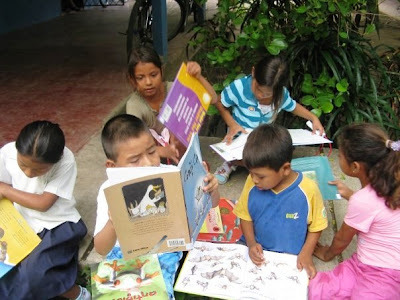 FUNDECI/GAIA and the students of Avon Maitland School in London, Ontario donated educational books to the Escuela Luis Alfonso Velasquez in Laguna de Apoyo Nature Reserve. Photo by Christine Bruxer. Working in a protected natural area means working with the people, and that means improving the conditions of impoverished people. We work closely with the local school (Escuela Luis Alfonso Velasquez) to make the educational offering more effective. This section of beachfront was reforested by FUNDECI/GAIA and is today part of the natural landscape of Laguna de Apoyo Nature Reserve. Photo by Christine Bruxer. 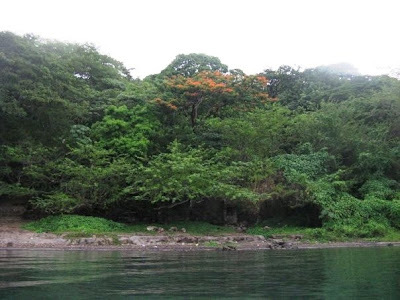 In all we do, we are trying to maintain Laguna de Apoyo Nature Reserve as pristine as is possible, to be passed on to the coming generations clean, unpolluted and without grave environmental problems. We can already see some successes, for which all of us should be happy and proud. 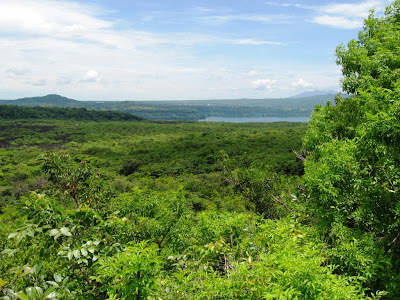 The management plan for Laguna de Apoyo Nature Reserve has been approved and active patrolling occurs today. Our staff member Jeffrey McCrary was the coordinator for the Management Plan development. Howler monkeys, once exceedingly rare around Estacion Biologica, are seen daily. Neighbors are more conscious than before, and willing to work together to protect our area. You are invited to visit Estacion Biologica Laguna de Apoyo. Come to study Spanish at Apoyo Spanish School, participate as a volunteer, or simply spend some days enjoying our area. Some folks think the twenty-first century will be the century of concern for water. We very well may run out of useful water before other resources are exhausted, especially given our predisposition to destroy the quality of many water resources. The Nicaraguan government has declared that access to water is a priority for all people. We at FUNDECI/GAIA celebrated World Water Day March 22 with the Nicaraguan government and civil society at the Masaya Volcano National Park. The people present represented the Ministry of Natural Resources and the Environment (MARENA), the Ministry of Health (MINSA), the Nicaraguan Water Company (ENACAL), members of the municipal governments of Masaya, Nandasmo, Nindiri, and Masatepe, and many people from non-governmental organizations, including FUNDECI and the Indigenous community of Monimbo. Our focus for this day was Lake Masaya, a marvelous but tragically contaminated volcanic crater lake inside the Volcano Masaya caldera. We spent the morning with local schoolchildren, observing the fish and water of the lake, and in the afternoon, we participated in a forum discussing the situation of this lake. Solid waste from surrounding communities collects along the waterline in Lake Masaya. Photo by Wendy van Kooten. 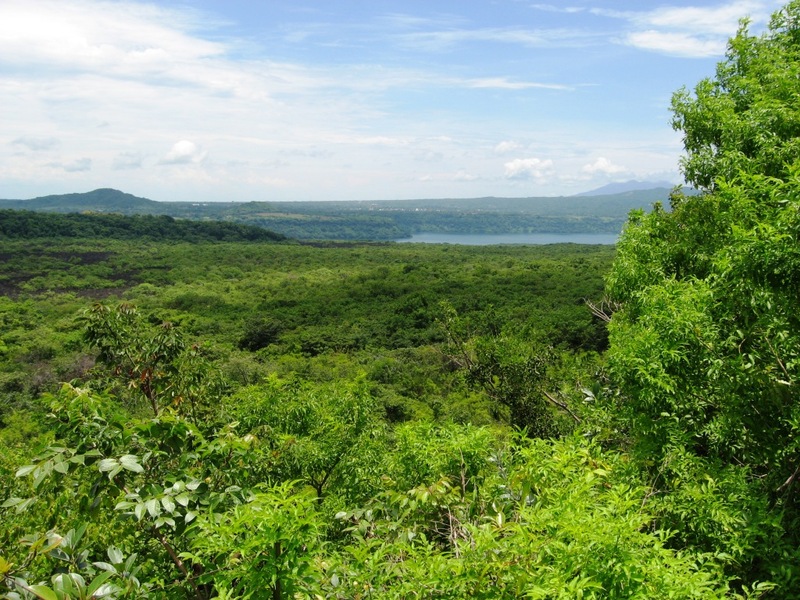 Lake Masaya receives inconceivable quantities of liquid and solid waste. Hundreds of gallons of polluted wastewater from Masaya pour into Lake Masaya each hour, and trash enters from communities in several directions. The lake is filling in from sediments and solid waste, and the fish are dying in large numbers. The incredible scenery of this lake from a distance is ruined by the shoreline littered with plastic and the putrid water. Nicaragua has so many great sources of water, and so many of them have been destroyed. 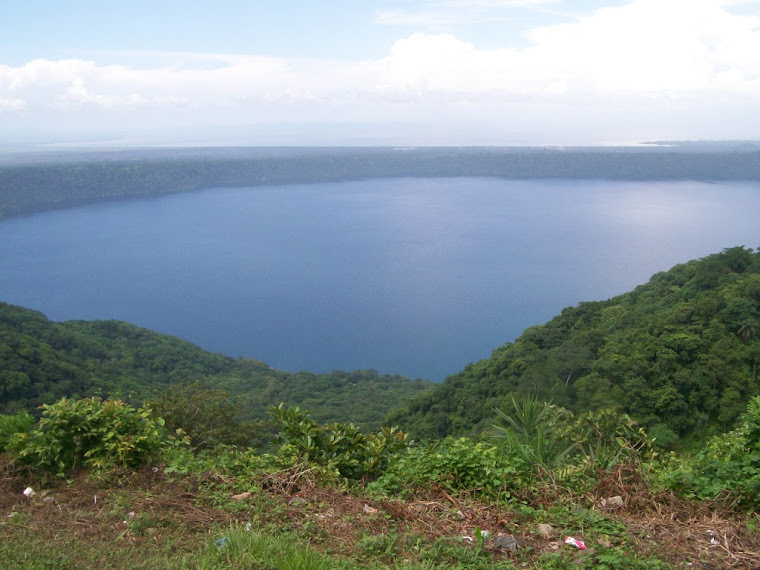 Lake Managua, also known as Xolotlan, is terribly polluted, but once was a source of drinking water for Managua. Tiscapa, like Lake Masaya, receives overwhelming quantities of municipal runoff and garbage with each rain. Nejapa went completely dry recently. Lake Apoyo is still beautiful but facing enormous quantities of trash from visitors. Volcano Masaya National Park Director Liliana Diaz and a local youth admire a fish from Lake Masaya. Photo by Wendy van Kooten. In spite of horrendous quantities of trash in and along the shore of Laguna de Masaya, the lake is teeming with life. Local children and park rangers admired the fishes dredged from the lake with seine nets. The local children knew all the names, because they eat the fish! 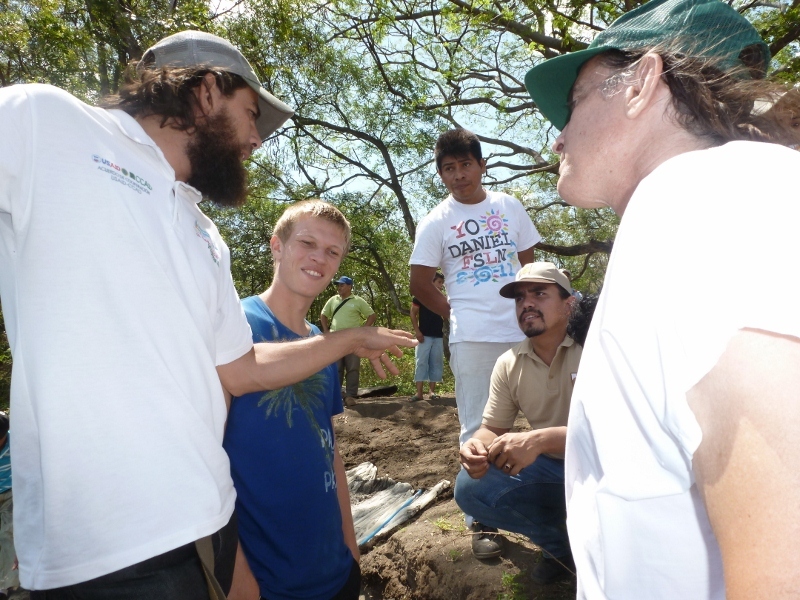 Members of MARENA, the local community, and staff from FUNDECI/GAIA debated the dilemma facing Laguna de Masaya. Photo by Wendy van Kooten. Presentations on water issues in the lake and vicinity were made throughout the afternoon. The presentations were attended by members of the municipal governments throughout the region, along with the ministries of health, agriculture, and the environment, and members of communities including Masaya, Masatepe, Nindiri, and Nandasmo. Jeffrey McCrary demonstrates the varieties of fish inhabiting Lake Masaya to members of the government and civil society on World Water Day. Lilian Diaz, the Director of Volcano Masaya National Park, shares with the public on World Water Day. Lake Masaya as seen from the Santiago Crater of Volcano Masaya. Would you like to help protect the water bodies of Nicaragua? FUNDECI/GAIA can arrange volunteer projects and internships in Lake Apoyo and other locations. 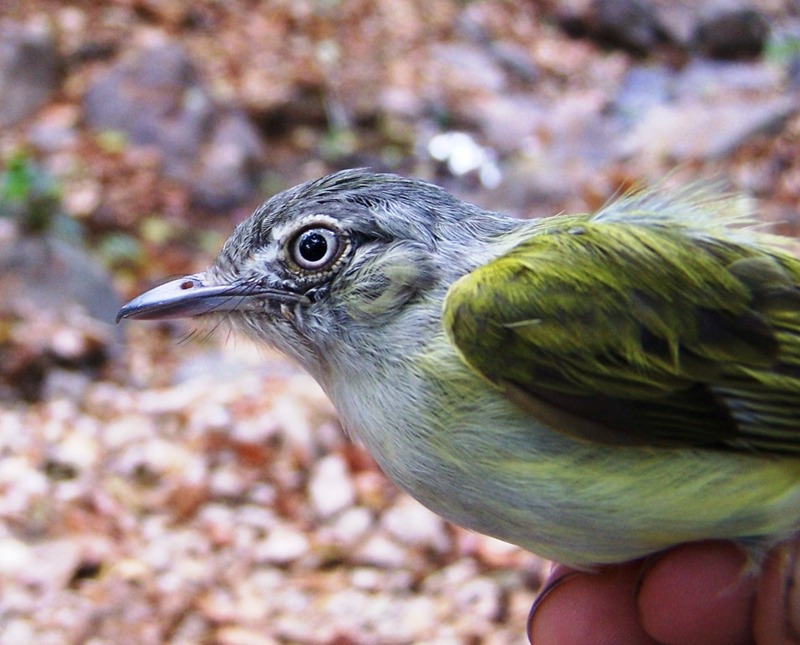 You can make a difference and save the most precious single resource for future generations. Please contact us if you would like to volunteer.